There’s a new champion on LoL’s Public Beta Environment (PBE) ready for testing. Though it sounds like she’ll be testing others too – me, with her British stereotypes, and other champions, with her fists. “Imagine two giant hextech gauntlets. Now imagine a total badass who loves using those gauntlets to hit things. Hard. That’s Vi in a nutshell,” says Riot associate champion designer gypsylord. Nutshell or no, Riot’s man continues in that vein for some time. “Have you ever wished you could punch an enemy with such an impact that you hit the enemies behind it? If your answer is yes, you may enjoy playing Vi. “Have you ever had the desire to wind up a punch powerful enough to carry you across the battlefield, clocking anyone unlucky enough to get in your way? If your answer is yes, you may enjoy playing Vi. Yes, thanks. Vi is all about those fancy gloves, he adds – she’s a “high mobility high damage bruiser who picks a target, launches herself into the fray, and makes that target deal with her”. Let’s get into the nitty gritty of how that works, then. Vault Breaker sees Vi charge up a powerful punch which carries her forward, slowing movement while increasing damage and dash range. Similarly, Excessive Force turns Vi’s basic attack into a charge punch, damaging enemies behind the target. 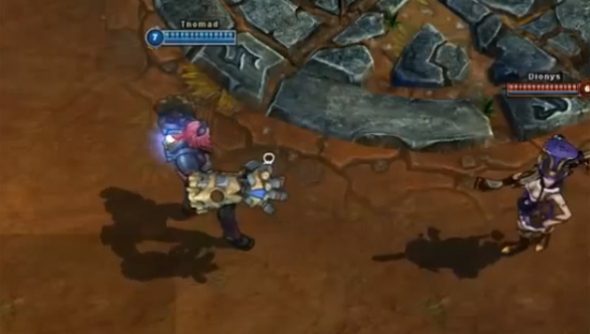 Assault and Battery, meanwhile, enables her to knock up and suppress an enemy champion for 1.25 seconds, dealing 200 damage. What’s more, Vi becomes immune to crowd control and topples any enemies along the path to her victim. Vi isn’t made up entirely of aggression, mind. One of her passives is Blast Shield, which activates a shield worth 10% of her max health for five seconds for every hit she lands – sensibly balanced by a 12 second cooldown. Then again, another is Denting Blows, which has every third attack deal extra damage, grants 30% increased attack speed for four seconds and temporarily reduces the target’s armour.